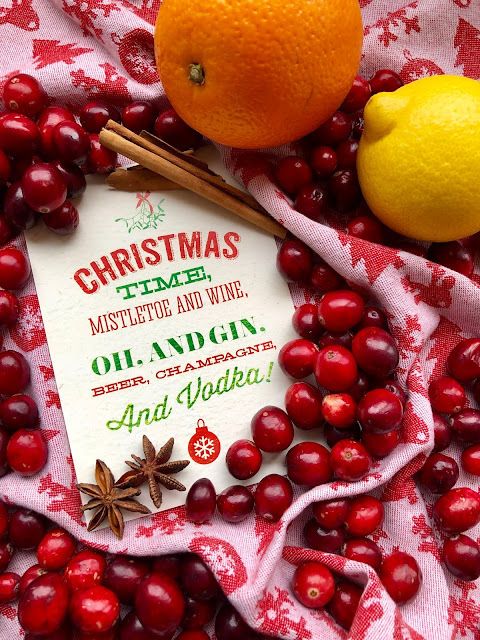 We wish you a Merry Ginmas! No festive meal is complete without Cranberry Sauce. 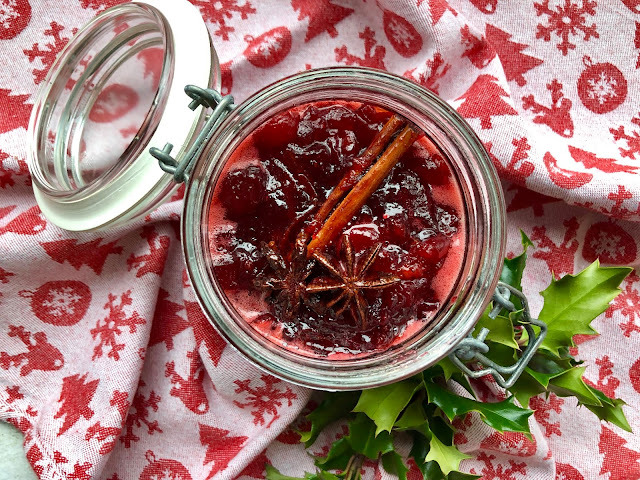 This version includes Gin for a modern twist on the classic Christmas relish. Perfect to accompany a Thanksgiving or Christmas dinner and would make an ideal edible gift for any gin lover. We wish you a Merry Ginmas! 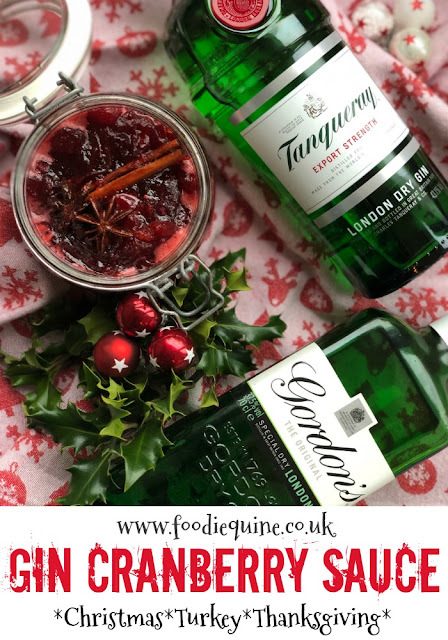 So far I've added the juniper spirit to Gin Butter and Gin Mincemeat, made a Mulled Gin and rounded up 10 Christmas Gin Recipes for UK Bloggers. 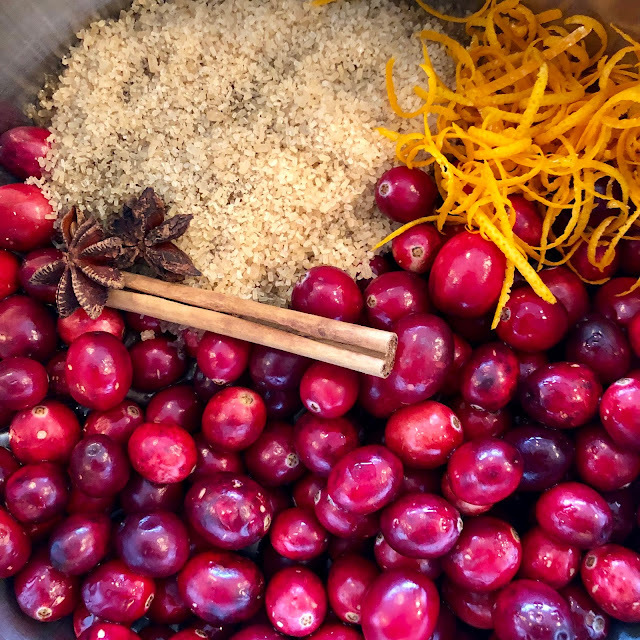 Today it's the turn of Cranberry Sauce to get the Gin treatment. Most usually made with Port as the boozy component I whipped up a batch of Gin Cranberry Sauce to accompany a pre-thanksgiving turkey dinner. Fresh cranberries are just beginning to appear in the shops so grab a pack when you spot them and get ahead of the game with your Christmas prep. The choice of gin used comes down to personal taste but I'd recommend something with a strong juniper flavour rather than anything too light or floral. Alternatively you could use a Sloe Gin, a Mulled Gin or one of the many Christmas Gins. Where there's gin there needs to be lemon. No ice and a slice here, instead the juice to add some sharpness. Gin for the festive win! Prepare all the ingredients and place in a saucepan. Bring up to the boil and then turn down to a simmer for 10 minutes. The berries will begin to audibly 'pop' and turn jammy. Decant into a sterilised airtight jar, allow to cool and store in the fridge. Remove star anise and cinnamon stick before serving. Can be served chilled or warmed. This is fantastic! Gin makes everything better and I didn't realise cranberry sauce is quite quick to make. The perfect addition to any festive meal. Once you've made your own homemade version once - whatever the recipe - you'll never go back to shop bought. I love anything with cranberries! This recipe looks tasty! Do you think adding nutmeg would work? Definately! Feel free to mix up the spices and add your favourites. I think I have to make this for Christmas dinner this year. All those spices plus the gin has me sold. Winner Winner Gin for Christmas Dinner! Cranberry sauce is one of my favourite winter condiments but I have never tried adding booze to it. You definitely sold it to me Claire :) Gin Cranberry Sauce here I come! I love gin in anything but I think gin cranberry sauce would just be amazing. What a great idea! The juniper and cranberry flavours go together so well. gin-gle all the way? I love how you've a knack for adding gin to EVERYTHING, might give this a go this year !! I fear that I've become infamous for it! I always love your gin recipes! This sounds like the perfect side for my turkey this Christmas! I'm making this! Mother-in-law, aunty, friends I hope you aren't reading this and spoiling the surprise :-) Fabulous, Claire.